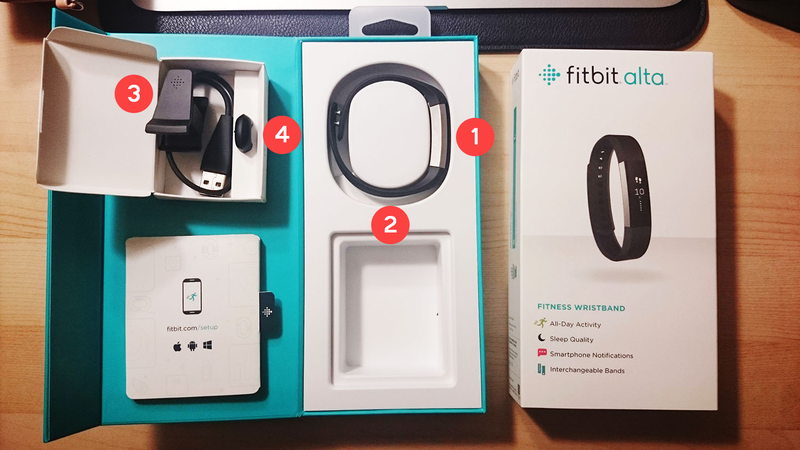 Previously, I shared about how to setup your Fitbit Alta for the first time. In this post, I'm sharing an unboxing (of sorts) and a review (kindof) having been using the fancy bracelet for two weeks (and counting). 2. Rubber strap (attached to the tracker) -- or is it silicone? Other items include paper stuff and warranty notes in multiple languages that nobody really reads. Instead of a comprehensive setup guide, a note in the box suggests you go to ww.fitbit.com/setup to get your gadget up and running. I did just that and had quite a few hiccups but I eventually got over the initial setup hullabaloo. So don't follow the note, read my setup guide instead haha. 1. The form - It's functional and stylish at the same time. I got the small black version which I found perfect for my wrists. There's also a larger version available. The main reason I decided to go for the Alta is the form factor. The band isn't too wide and the straps can be swapped, though for now only Fitbit sells them and they're horribly expensive. Don't worry, I'm sure eventually 3rd party sellers will come out with better bands and more colors to choose from. 2. It tracks steps quite accurately - I tried walking 10 steps while watching the step counter on the Fitbit app and holey moley it's perfect haha. I'm thinking it has something to do with the observer effect (naks very quantum physics) which changes the behavior of the activity being observed (in this case, the tracking) just by the mere act of observation. Don't we all try to act perfectly under close watch? Joke lang lol. It tracks well enough for me not to doubt my activity for the day. 3. Silent alarm - before you call it stupid, here's the magic word: vibration! 4. Move reminders - 10 mins before every hour (within your designated time range) it reminds you to walk 250 steps para cool. On the first day of using my Fitbit, I was so amused by this feature that I really took it to heart to walk 250 steps every time it reminds me to. Anyway, it will only remind you to walk if you haven't met the 250 steps/hour goal. 5. Call and text alerts - as long as my bluetooth is on, the phone with push call and text alerts to my fitbit. It shows the sender name and message in a marquee which I find very useful specially when I'm out on commute and my phone is buried in my bag. 6. Good battery life - I was able to use it for a good 4 days before I received a notification (vibe and email) that my Alta's running low on juice. At my current settings (no silent alarms, no all-day sync), I only need to charge once a week. 7. Auto sleep tracking - which is super cool. Fitbit logs your 'restless' and 'awake' minutes and takes all that into account to calculate your sleep quality based on your #sleepgoals lol. I set mine at 7hrs a day and so far I'm averaging at 8. It's not really something I would check myself so it's good know a gadget is tracking all this for me. 10. Water resistant - it doesn't mind me washing the dishes with it, but I take it off in the shower to be sure. 1. Short charging cable - it's awkwardly short and a hassle to use. I hope the cable can be detached from the cradle. Good thing I only have to charge the Alta every 4 days or so. yey for long battery life. 2. No HR monitor - This doesn't monitor your heart rate. No biggie cos I'm not particularly looking for this feature, but I thought I'd tag it as a con so you'd know. I'm thinking Fitbit has plans to release a HR version of the Alta sometime in the future I'M NOT SURE. But given that it could compromise the size, who knows. 3. Move reminder - the move reminder is limited to 5-14 consecutive hours WITHIN THE SAME DAY. Working the graveyard, I wanted to be reminded from 9pm to 5am, but it won't let me cos it's crossing the next day and I figured it'd mess Fitbit's daily reporting chorvabels. I wish they'd enhance this feature to allow adding multiple move reminders instead. 4. Screen isn't scratch proof - I plan to buy screen protectors but I'm not sure if it will affect the tap efficiency haha. The face of my Alta has a tiny hairline already huhu. 5. Limited 3rd party app integration - Fitbit has partnered with quite a number of health monitoring apps (see here) but I don't see Nike+ Running yet which is weird cos it's too popular haha. It's where all my runs are logged and I would love to be able to integrate that with my fitbit data. Counts for better estimate of calories burned. 6. No GPS - I would love the Alta to have GPS without sacrificing its already perfect form factor. I've read about super small GPS modules, I hope they could find a way to get a small receiver that wouldn't compromise Alta's size. 7. I developed rashes - Taray! And it's not because I have sensitive dugong bughaw skin, but because I'm dugyot most of the time and the strap has turned into a cozy abode for bacteria. Now, I keep it a point to clean the watch every once in a while specially when I sweat a lot haha. It's really just a matter of sanitizing haha. 8. Hard to put on - Amazon reviews contain a lot of griping about how hard it is to put on. If you see the image on Con #1 you'll see how it's supposed to be strapped on. Unlike the Charge HR or the Blaze, it doesn't have a buckle strap, you have to push the two pins to the holes to set it in place. I have to agree that it's hard to put on, but that's only at the beginning. Eventually the holes will loosen up and make it easier to lock in the pins. This Fitbit is really not for the active type, if you're already familiar with the range of Fitbit trackers, the Alta offers literally nothing new except for the form factor. The older Fitbits have sported the same set of features, step counter, silent alarm, sleep tracking, fitness goals, etc. so if you're looking for something new minus the form factor, you can check out other trackers instead. Seriously though, this is (IMO) the best looking and most functional fitness tracker there is for people like me who is mostly sedentary. Has it helped me in my seemingly eternal weight loss journey? As with any tracker, like a fitness trainer, it's a good motivator. Looking at my wrist sporting a fitness tracker kindof pushes me to live up to my fitbit goals naaaaks. But of course, a gadget can only be as effective as the one who wears it. I really need to be more disciplined haha. I bought the Fitbit Alta Fitness Tracker, Silver/Black, Small at Amazon for $129 when I was still in the US. I'm not sure if it will be available locally.